Home > Books > Go Girl! #5: Sleepover! PJ Party Puzzle! Olivia is starting to worry about her very first sleepover. She's thought up a hundred different things that could go wrong-and they're all totally embarrassing! Olivia doesn't want to cancel on her best friend at the last minute, BUT... maybe she should just stay home? About Rowan McAuley (Author) : Rowan McAuley is a published author of children's books. A published credit of Rowan McAuley is Go Girl! 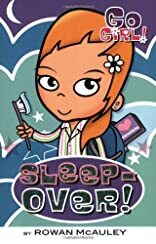 #5: Sleepover! (Go Girl! ).